So a quick summary. 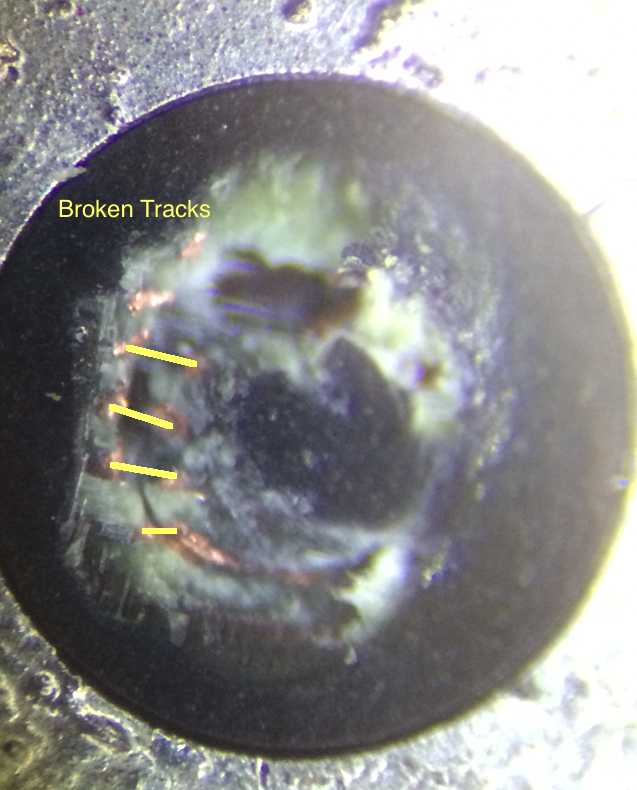 We now know that this fault is caused by Wrong Screw Placement, or failed “self repairs” . So the screen repair on an iPhone 5S is not really that hard to achieve for an experienced Technician. Without going into the quality of screens and the difference between a cheap screen and an expensive original screen, we will just look at the repair process.Here is an excellent guide from iMore on how to change your iPhone 5S screen . once you have had a look at the link, we will explain where this blue screen fault all goes wrong! 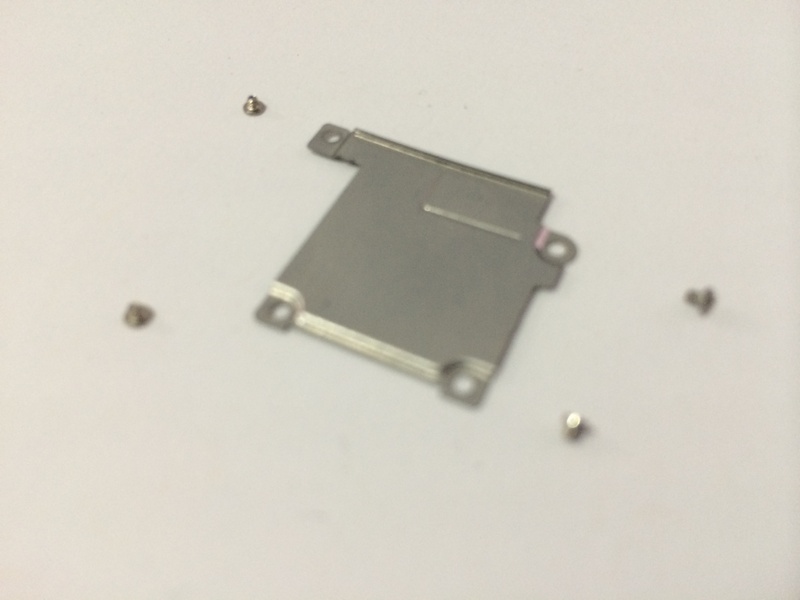 When you carry out a screen repair on the iPhone 5S, there is a shield which need to be removed, this shield covers the LCD cable, Proximity sensor cable and the touch screen digitiser cable. This shield is fixed to the board of the 5S to stop the cables being dislodged easily by a drop. This was a common issue in older iPhone models and this is the reason the shield has been put in place. Now you can see from the image above that these screws are all individual and should be put back in the same slot they came out of. As you can see the RED marked screw is the shortest, so if you put the wrong screw in this slot, it will definitely result in damaging the logic board (BLUE SCREEN LOOP) if you put one of the BLUE or YELLOW marked screws in the RED marked slot, it may result in irreversible damage. the GREEN screw is easy to tell apart if you get them mixed up as its not magnetised. Here at iPhone Bits we have successfully repaired this issue by repairing the logic board tracks, obviously every case is individual and we would need to see it to assess if it can be repaired, but we maintain the following . If we cannot repair it then its not repairable . Here at iPhone Bits we pride ourselves on the fact that we can repair faults that no other repair centre will be able to do. This is the force that drives us on and makes us spend the time researching these faults and not giving up until we find the fault, and can offer a repair . Hello, i have an iPhone 5S that has blue screen issue, it happened after i smashed the screen, i left it into a repair centre and when i got it back they said it was not repairable, do you think this is the issue with mine? I have had this happen previously except the blue screen would disappear when reopening the lcd as though it was shorting or the pressure was causing the bsod. Hi Chris, maybe it was taking pressure of the tracks that where shorting when the screen is removed. its so easy to make this error and put screw in wrong place! Hi, I think I have got the blue screen of death on an iphone 5s. I am in Australia. Can you give me a ball park figure for cost of repair please ? This has happened to me today during a screen repair. I have been doing repairs for years and take pride in my work and its quality. I also have noticed since the release of the iphone 5 its important to put the plates screws back in the same place you take them from or random issues occur. I mention this because I don’t believe its possible that I put these screws back in the wrong place unless there was a freak accident. Is there any other possibility or fix you can suggest I look into? I of course tried the basics, different screen, original screen, battery, dock, frame, restore etc. Thanks for sharing this information with the repair community. It looks like your repair will be beyond the capability of many technicians. I will send people your way if they seem to have created this problem. Thanks for this Post Man ! Right on – saved my bacon ! I took the screw out and the phone was fine. I thought for a minute I had destroyed it. Its working 100% fine now. From now on I’ll keep an eye on those 4 screws. they all looked the same when I popped them out. Got the same problem here. How long time would it take you to fix this, and how expensive? Lives in Norway. Got the same problem… I have sent you an e-mail, but hasn’t got answer. Needs fast answer. Please contact. hi Daren .zrry for my bad english,i speak spanish ,portugues, maybe spanglish ,but i have same problem iphone 5s A1457, i changed 2 lcd but nathing Win error 14.Mac error 9.
how to fix tracks i am from Chile. i buy iphone in retail january 2014.tec-services dont make this. Do you have the skills to repair this issue by yourself? but how cost to repair this problem ? I have bought a second hand iPhone 5s with iOS 7, then I upgraded it to ISO 8, during that a blue screen with error 9 or 14 happened. I couldn’t fix it even with i tunes. 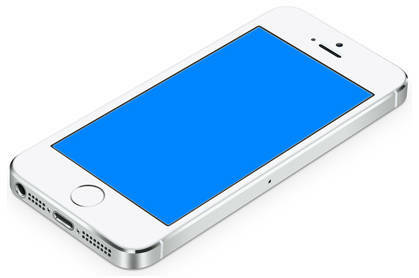 hi,i changed my iphone 5s screen and after turning on blue screen and restarting problem . what can i do for fixing this ? Hi I’m in France how I can fix that problem alone? Hi Darren, tried to replace a screen for a friend on 5s and getting apple logo for about 30 seconds then blue screen. Screen then flashes off then back to apple logo. Thought I had put screws in right place but panicking now cause it’s not my phone. Could you fix it please ? Thanks, Callum. ive had no blue screen but after i installed a new screen 5s.. the bluetooth call audio didnt work..
BT headphones- no call audio..
can email me if u had this before or shall i call you? Hey IBK were you able to repair it?. im in Comp village lagos and i just had the same issue too. A technician was doing a battery change on iPhone 5s. After that a blue screen appeared. What I noticed, is that the lcd screws and shield weren’t removed by the technician, therefore the whole work was done with screen being up, but not taken off. What do you think, can that cause a problem? or what might be the cause? Before, the iPhone was functioning as always, despite the buttery going quickly down. I have the same problem. Error 9 in iTunes after got repaired. I’m on Indonesia, is it possible to send the device to you? I have got same problem how i solve it in Saudi arabia ? I had iTunes Error Code 9 right after replacing the iPhone 5s Screen. I thought, it may time for me buying new iPhone 6 finally. This article saved me from inserting wrong screws for cover where dimmer, camera, and lcd cable locates. Yes! it did fixed my issue, and finally DFU recover doesn’t prompt the error code 9 and installed correctly. NICE! I exchanged the battery of my wife’s iPhone 5S. And had the bluescreen and Error 14 issue! I thought, now she will killing and I prayed to god. And he send me the link to your website! THANK YOU again! I thought my life was over! hey, i not long ago got my iphone 5s screen repaired and all it does is loads onto a blue screen after the apple logo doesnt connect to itunes to restore it or anything! Hello Shelbie, give us a call and we will see if we can help with your problem. Hello, I have iPhone 5s 16GB with error 14 and blue screen during restore. Can it be fixed and for how much money? Thank you a lot, you are my last hope. Hello Daniil, where about are you based? At present we are unable to take anymore blue screen repairs in until further notice as we are swamped with them lately. I found if I removed all screws and did a DFU reset all was good. Hope this helps other like minded fixers out there, there is no logical reason for apple to place the tracks under the screw other than to try and f us guys up, if you read the autobiography you will understand more than anything this is his aim. he hates us for fixing broken i things. together we will find a way. one for all! I started out because they wanted £150 to fix siri it cost me £4 it was a simple fix! I have found Blue screen seems to come more from the flex cable of the earpiece proximity etc. try to be very careful with this! What is DFU ? I too have BSOD !!! Hi, this is very useful info from this site & everyone, thanks. What I dont understand is are these screw placement locations accurate? are you sure the yellow circle screw is 1.7mm size? I ask because that is a long screw & that location (yellow circle) is also directly on mainboard/logicboard. 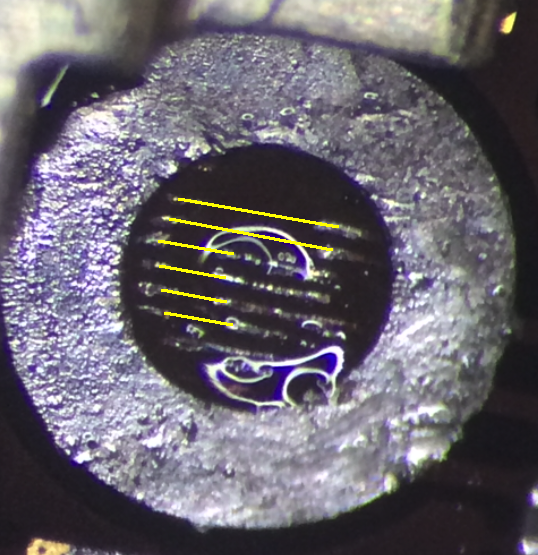 I took a 5S apart the other day & I found only one long (1.7mm) screw – the other three were 1.2mm or 1.3mm. Hi. i need to be sure about the screw locations. it has worked out alright? because have tried the screws and it cant work. am in kenya, can it reach you if i send it? Question: Why would my iPhone 5S need to not be restarted or backed up for 10 days? Question: What should I say to the tech at the iPhone repair shop? I got home and searched blue screen & iPhone 5S and discovered this insightful explanation. Hi Tex, sorry to hear about your problems, please try replacing the front facing camera flex and restore and see if you still have this issue. No need to wait 10 days, this will make no difference at all !! sounds like a display issue, try connecting to iTunes? Hi Darren, my Iphone 5S is having the problem you described, This happened after someone changed the screen. I’m in USA, can you recommend a place in USA to take my phone? Nick is so right, I started having blue screen after I started using original earpiece..what should I do? Hi I recently got a brand new screen fixed a month ago on my iPhone 5s and everything was fine until 2 days ago my phone just went to a blue screen then went to a black screen with the apple logo this happens over and over again until the phone dies and I don’t know what to do… I live in Manchester, is it fixable? If it’s fixable can I send to you? How much does it cost? Hi. I’ve done a few screen replacements, and got both the red and blue screen problem. The red screen was fixed by replacing the sensor cable but the blue screen seems to do something strange. I was fixing a 6+ that had a cracked screen and a button cable that was cut. I tested if the new screen works after pulling the old one out. Everything seemed to look fine so I moved all the components from the old screen to the new. I didn’t screw the shield in before booting it up first. First try, it didn’t seemed to boot at all. I removed both the sensor and the button cable since that seemed to fix the red screen, but it still didnt boot. I took out the battery cable and connect it again and it booted with no problems. I then connected the sensor cable while the screen was off, which caused it to shut off. I booted without the home button cable but leave the sensor cable, and got the blue screen. What’s going on here? disconnect all cables apart from the LCD , Digitizer and dock and let me know what it does? Sorry, my bad about the second part about the red screen. I was meant to say the blue screen was fixed when only the lcd and digitizer was connected. However if I connect then disconnect the other wires, it wont boot at all unless reconnecting the battery. Hi, my phone is exactly in this situation, I just want to retrieve the photos inside my phone. is that still possible? it would be very unlikely that you will be able to save the photos. Hiya, I’ve recently had my phone fixed due to the front screen smashing and when I brought it home it was doing a boot loop and blue screen every time it failed to boot. So then I tried to restore it but it was then coming up with an error (9). Do you think you could fix this please? Also how much would you charge?